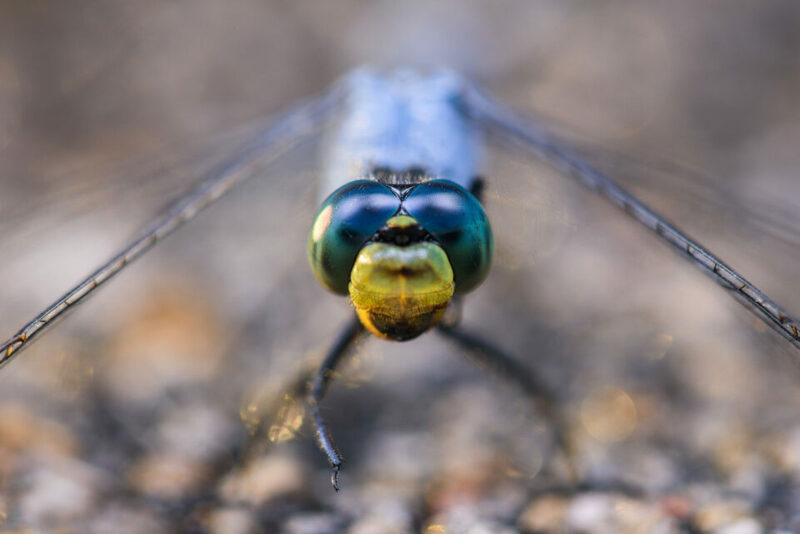 In macro photography, a “relatively large” subject is something the size of a dragonfly or a flower. It’s still small, but it’s not at the level where you need very much specialty knowledge to capture a sharp photo. If your subject is about four inches (10 centimeters) or larger, my recommendation is just to focus like you normally would on a moving subject. Use your continuous-servo autofocus (AF-C), with an autofocus area mode that does a decent job tracking your subject across the frame (something like dynamic area or 3D tracking mode). Even if your subject is staying still (say, a flower on a day without much wind), it’s still best to use continuous-servo autofocus. That’s because, while your subject might not be moving, you will be, no matter how still you’re trying to be. It’s impossible to remain completely motionless while handholding a camera, and any slight movement is very easily visible at such close distances. The biggest difficulty here is that fast-moving subjects still won’t be very easy to focus on, and there’s not much you can do about that. My main recommendation is to take several photos in a row — on burst mode, for example — since there may only be a fraction of a second where your image is perfectly focused. You don’t want to miss it. By the strictest definition, “macro photography” means that you’re focused at 1:1 magnification or stronger. So, if your camera sensor is 1.5 inches wide, the scene captured in your entire photo will also be 1.5 inches wide, or smaller. That’s where things get tricky. At this magnification, moving your camera forward or backward just a few millimeters at a time is more than enough to throw your entire photo out of focus. And even if you do focus successfully, your depth of field will be remarkably small. In fact, if you want just the head and body of an ant to appear in focus simultaneously, you’re probably out of luck. As you might expect, even the best autofocus systems on the planet will struggle in situations like this. The problem becomes even worse if your subject is moving around quickly, and you have to track its movement without losing focus. But that doesn’t mean it’s impossible to focus on tiny subjects, even if they’re moving. The insect in the photo below, for example, was moving around very quickly, and I was focused at 1:1 magnification for this shot. How did I manage to get it so sharp? The answer is surprisingly simple, yet counterintuitive: Use manual focus. Yes, for normal photography, manual focus tends to be slower than autofocus. Plus, for fast-moving subjects, it is generally less accurate. High-magnification macro photography is a different beast, though, and this is one case where manual focus is the best option available — but only if you use it correctly. The proper way to focus manually for macro photography isn’t to compose your photo, then spin the focusing ring until the image in your viewfinder appears sharp. Instead, it’s to set your focusing ring at a particular point, and then move forward and backward until the image appears sharp. For example, for high-magnification macro photography, I’ll set my lens to its closest focusing distance of 1:1 magnification. Then, I’ll slowly rock forwards and backwards in the field, by no more than a couple centimeters at a time, waiting for my subject to look focused. When it’s perfectly sharp — which may happen for just a fraction of a second — I take the photo as quickly as possible. This process is made easier by using a relatively small aperture, typically somewhere from f/11 to f/22. That, of course, cuts down significantly on the amount of light in your photo, and chances are good you’ll need to use a flash to optimize your photo. I’ve covered some of this before in an article on macro photography lighting. If it helps, you might consider resting your camera on top of a monopod or stick while you move it forward and backward. That can cut out on some of the extra vibrations and imprecision from handholding the camera, although the downside is that you’ll lose some flexibility with regards to your camera’s height. Also, be warned that even a good macro focusing technique won’t give you a perfect success rate. Personally, even under the best possible conditions (no wind, and a nonmoving subject), only about 1/3 of my handheld 1:1 magnification photos are as sharp as possible. It’s not an easy job. However, this is the type of thing you’ll improve upon over time. Like all areas of photography, it takes practice. Some macro photographers get around the difficulties of handheld focusing simply by using a tripod. Which types of subjects lend themselves to this method? In general, for a subject that is moving, it is almost impossible to use a tripod and accurately capture an in-focus macro image. Instead, it’s best to use a tripod for relatively stationary macro subjects. If your subject is staying still, you have a lot of flexibility in how you set up your tripod. You can take as much time as you need to move the tripod forward and backward, adjust its height, and change your composition. Still, there are some tripod attachments that are invaluable for this type of photography, since they’ll make your work much, much quicker: Focusing rails. 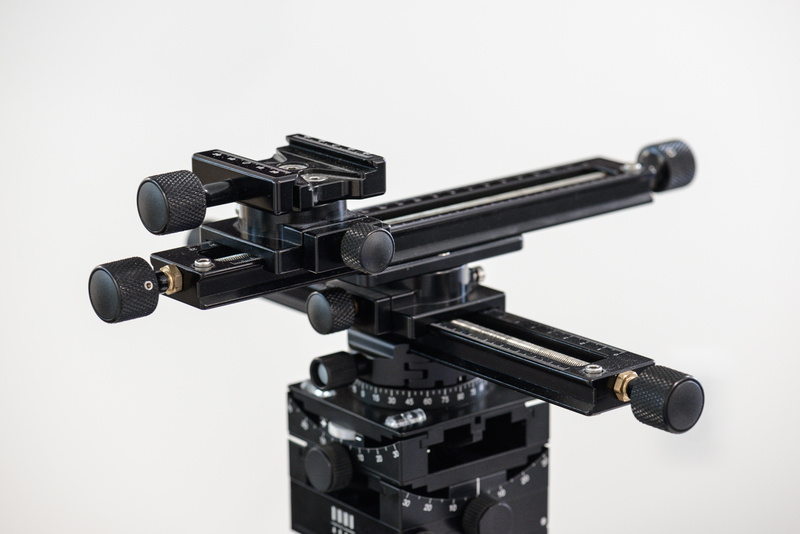 With a complete focusing rail setup, you have the ability to move your camera by fractions of a millimeter at a time, in any direction. Compare that to a typical ballhead, where the finest movements you can make are very large and imprecise. The difference will be night and day; a focusing rail setup can save you a lot of time and headache in the field. Also, focusing rails make it far easier to focus stack your macro photos, which can be valuable for capturing the greatest possible depth of field with nonmoving subjects. Where there’s a will, there’s a way. Focusing in macro photography isn’t an easy task, but you still have options at your disposal to capture the sharpest possible photos. For relatively large subjects, just focus like you would for typical handheld photography, as if you’re just taking normal pictures of wildlife. 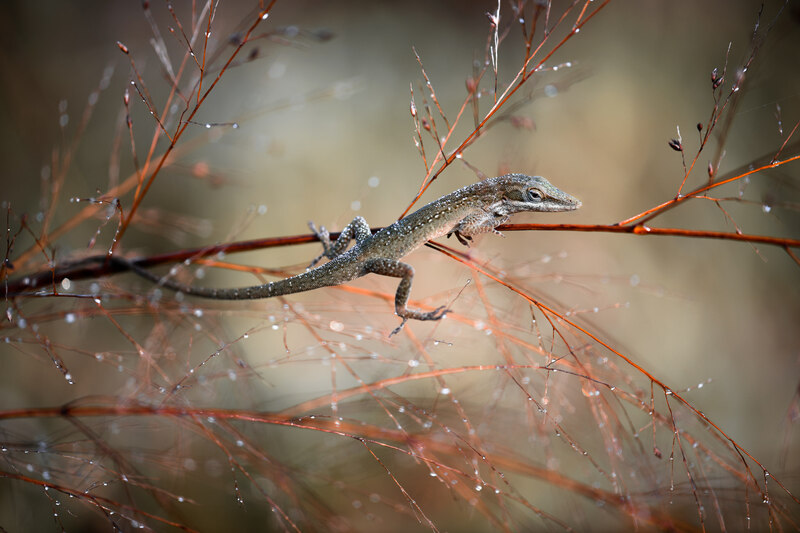 For smaller subjects, though, your best bet is to focus manually, while rocking forward and backward until your subject looks as sharp as possible in your viewfinder. Neither of these is a perfect method, so, if you’re photographing nonmoving subjects, you may prefer a tripod-based setup with focusing rails instead. As with all things in photography, the method you use will depend upon the specific subjects you tend to shoot. It’s possible to focus on nearly every subject in macro photography (though bugs in flight still remain my nemesis), so the best thing to do is simply to practice. The more time you spend perfecting each focusing method, the better your macro photos will be. I checked our subscriber list, and you don’t appear to be on it. Are you getting unwanted emails from us, or are you getting post notifications at the top of your screen? If you want to unsubscribe from the post notifications, click the red bell at the bottom-right of any page on our site, and just click unsubscribe. Also, I modified the comment you just left to eliminate your email address — I don’t want any spam bots to automatically add it to their lists. For taking your Macro work to the next level, I would recommend anything (books, courses, seminars) by Heather Angel. www.heatherangel.co.uk / @angelantics Truly inspiring work. Her work is indeed wonderful — thank you for sharing. Image 5 caught my eye. Then again all the rest are gorgeous. I agree, manual focus is the way to go for non-moving/still subjects. Thanks for sharing! Happy to hear that you liked them, Oggie. The day I photographed the berries was very beautiful. There was ice everywhere, and it was hard even to distill it down into just a single subject! I guess that’s the beauty of macro photography is learning to distill the elements from the big picture, finding and isolating the interesting details in an otherwise overwhelming visual scene, kind of reminding the viewer the parts that make up the whole, the parts we easily miss. I am new to macro photography and looking to buy a macro rail setup. Can you suggest some brands that I should consider that are less than $200? I’m sure it’s not the best money can buy, but at 23 $ and with an average rating of 4.4/5 (based on 173 customer reviews), I’m sure it would be more than good enough to get started. I’ve got one of those and whilst it’s not perfect, for casual use I’ve found it does the job very well. Beware equipment with a price that’s too good to be true! I’ve tried inexpensive focusing rails, they’re all in the junk drawer or garbage. Why spend all your valuable TIME trying and fighting a rail that won’t hold position or vibrates when you breath on it? So based upon two user reports, we have one “good enough” and one “avoid like the plague”. Such a spread in opinions is entirely to be expected, and is the main reason to depend on “test pools” of >100. Reading through said user reports, from one extreme to the other, I usually get a good idea of what to expect. In the case of Amazon, I have found that a product is usually adequate when it’s rated ~4/5, and great when it’s rated >4.5/5. To find out if a focus rail is useful to a budding macro photographer, I still think the “good enough” 23 $ option is a great starting point. I would recommend the Velbon Super Mag Slider for its build quality and easy of use. It may not be the cheapest but will certainly last well and you might be able to pick up a used bargain on eBay. Ha, I should have read this reply first before replying to Alan above… So, one more recommendation for the Velbon rail – noted! What is the brand for the focusing rail and tripod head? I shoot a Nikon D810 or D500 with a Nikkor 200mm ƒ4 Macro lens. The lens may sound “long” but it gives me the working distance I need, and is still rated as one of Nikon’s sharpest macro lenses. I’ve tried using a Gitzo monopod but I’ve never gotten a sharp macro shot from it. The only drawback is the Ballhead, a gear driven head would provide much more control. The lizard image is absolutely perfect. I’d like to think you gave him a grasshopper as a reward and that you really used an f stop much smaller than you admit. Definitely an inspiration to keep trying! I was surprised support was mentioned so late in the list, but then I am amazed at how often I observe people shooting anything without support and griping about their soft shots, or specific to macro, their inability to control focus. I’ve always found a light tripod, or monopod key to improving my chances of getting the macro capture I intend. The other element I was surprised was not mentioned were the less expensive options for the ability to shoot macro, since many don’t have the resources to invest in a macro lens just to explore this challenging area. The use of extension tubes and close-up lens filters are less expensive options that can also yield great results. In fact, for me, depending on the subject, I often prefer to use my 70-200 with a close-up lens, since that zoom allows extra framing options. With all things there are pros and cons, but these gear options are far less expensive and allow one to expand their tool box and capture options, before investing in a dedicated macro lens. The 105mm is a great lens for many things, but it’s a focal length well covered, for most users already, so investing in a macro can be spendy. Very true! I do go much more into all the options for different budgets in my larger macro photography tutorial photographylife.com/macro…y-tutorial) — just didn’t want to overload this article with that info, since it’s not as relevant solely for focusing. I own a a bunch of gear from RRS, but also own support components from Kirk, and even Newer (readily available from Amazon). Less expensive options are not always poor quality. Though I own a handful of Nikon’s best cameras and lenses from 10-600mm, I have never had any issues using some of the less expensive plates, rails, and mounts. To be sure, there is some junk out there – but it’s not always necessary to pay the top tier brand premium. Also, relative to rail solutions. In my experience, these typically come into play with static subjects – which means it’s easy to adjust your tripod position a bit, position of the rail in your ballhead or clamp, etc. so that a single rail is often all that is really needed – not the more exotic stuff that has been promoted. Just saying . . . . I believe in reliable support gear and own a ton of it. That said, just because something is less expensive doesn’t mean the quality is unacceptable. Show some discernment. I am wanting to buy a lens for my D750 that would support macro photography, but not sure I want one that is dedicated to macro. Are there macro lens that have other functionality? Like….wide angle for landscapes, general travel photography? Probably your best bet would be extension tubes used with a longer lens/zoom you already own. Wide angle lenses are doing the opposite of what you need when taking macro shots, so a general wide to tele travel lens may not work so well for macro work. Also macro work often requires close lens to subject distances – not something one typically finds in general do-it-all travel lenses. I haven’t tried extension tubes with longer focal lengths, and it’s been many years since I’ve done it, so my mind is a little foggy. One key difference in a macro lens versus others is the far shorter minimum focus distance. That is key to maximize the size of a small subject to fill your frame. Adding an extension tube, or stacking tubes, allows one to cut the minimum focus distance of the lens used, to gain some macro capability. The trade-off is that the focal range is much smaller than the lens would have if the extension tube(s) weren’t added. In my experience the 50mm f/1.8 was a great lens for this kind of stuff, with static objects. I’ve also used them with the 105mm and even big primes, since it works all the same, regardless of the lens. Because of the impact on focus range, manual focus is often the only way to establish desired focus, or if you have a focus rail in the correct dimension, it can provide more granular control over movement, since intended focus can be a challenge to nail. I typically use the heaviest support possible, along with remote shutter trigger to keep things as solid as possible. I didn’t see a way to edit my reply – so let me clarify a couple points. I never used extension tubes on longer focal lengths for *macro* shots. I’m sure I tried the extension tubes with my 70-200, but I don’t recall the results. I’m guessing though that because I settled on using a close-up lens on my 70-200 f/2.8 for static and moving subjects, it suggests that the narrow range of focus was less workable than what I found with the close-up lens. The pro of extension tubes is no extra glass to steal light or mess with the optical glass in the lens. A close-up lens is going to steal some light and potentially risk some softening, since it’s glass that the lens maker didn’t factor into the design. Using an extension tube with big glass can reduce the minimum focus distance, but also puts some limit on range of focus. As in most options, there are pros and cons to be understood, weighed, and worked within. Fully agreed, except that extension tubes are best used with shorter focal length lenses (i.e. 50mm or so), and they won’t give you much extra magnification on longer lenses, like a telephoto zoom. Instead, for longer focal lengths, a close-up filter attachment will give you more magnification. I’d recommend the 50mm + extension tube route, personally. 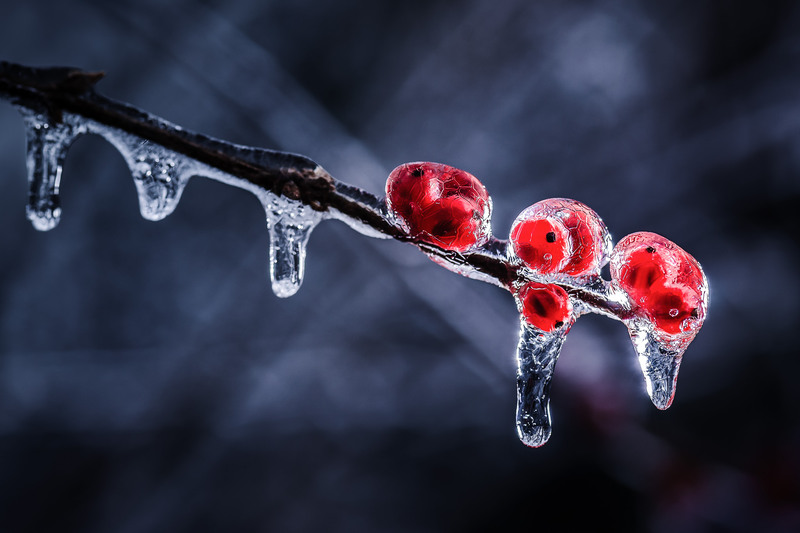 The iced berries gave me lots of idea. Thanks for this post – it was of incredible help. I am busy photographing my hellebore flowers to compile a catalog. I’m using Nikon D750, a Nikkor 105mm 1:2.8G lens with a MF18 macro flash on a tripod. I’m still finding it difficult to get that crisp look to the flower. Where am I failing? What is recommended settings in this scenario? Hi Francois, can you attach a link to the photo in question? It’s hard to troubleshoot without one. FYI — if you attach two or more total links, I’ll need to approve your comment before it goes live, which may take me a few hours (depending upon when I receive the notification). Nice article Spencer, backed up by great images. I found the autofocus useless once you approach 2:1 or larger as you say in your article, manual focus is the best. Most of my macro attempts are moving subjects and I found that often my monopod, which I hardly ever use for normal photography, came into it’s own. The reason being, many subjects are quite close to the ground and it helps to stabilise the gear. it makes it easy to move the camera forwards and backwards with gentle movement without disturbing the composition too much. As many know, the smallest change can drastically alter the background in macro. It works well higher up too, between 3 and 5 feet. If you need to handhold, it is easy to lift the whole thing, including monopod, off the ground. My Velbon RUP monopod is strong but light, and quickly adjusted with lever locks, yet lifting the camera off the ground when it is fitted does not add much to the weight. Macro is the most frustrating discipline, but also can be the most rewarding. Be prepared for a high fail rate, but it is all a part of getting that one or two brilliant shots. I love it, annoying as it can be, but the challenge makes it fun too. Someone mentioned the works of Heather Angel – she is the meister of macro, lots of books and magazine articles, well worth a look if you are starting out. I also recommend finding the money for a proper macro lens – not cheap, but all the other methods are fiddly, and it is great just to attach the lens, and you’re good to go. A one time purchase which you can keep as you change cameras over time. My Sigma 105mm was in use originally on my DX cameras, and now lives on my FX with no crop needed – of course, on DX it equalled 157mm due to the x1.5 crop factor, whereas it is a true 105mm on an FX – but sharp as a razor, and the equal of any of them. I don’t think it is possible to buy a bad macro lens, they are prime lenses, and the simplest of optical designs, but just have close focus abilities. They are sharp, show little or no CA and have a very flat field of focus. Fiddling around with close up filters, lens reversals and extension tubes often reduces image quality, which is what you don’t want to do. Macro and landscape are my two main interests, so thanks for the article, I hope it encourages more people to get into it. I am just a begginer. But i think i can do a lot in photography. I love those feelings even if i get bad shots. I don’t have any experience as i don’t have any device. No camera, no tripods, nothing. I got a laptop and now photographylife.com has become part of my future as those very experience mens have given worthy knowledge for my empty mind. Thank you so much guys. I fully agree, Ross. Always appreciate your comments. Monopods (and a good lighting setup) are all but essential for high-magnification macro photography, especially at 1:1 of living/moving subjects. 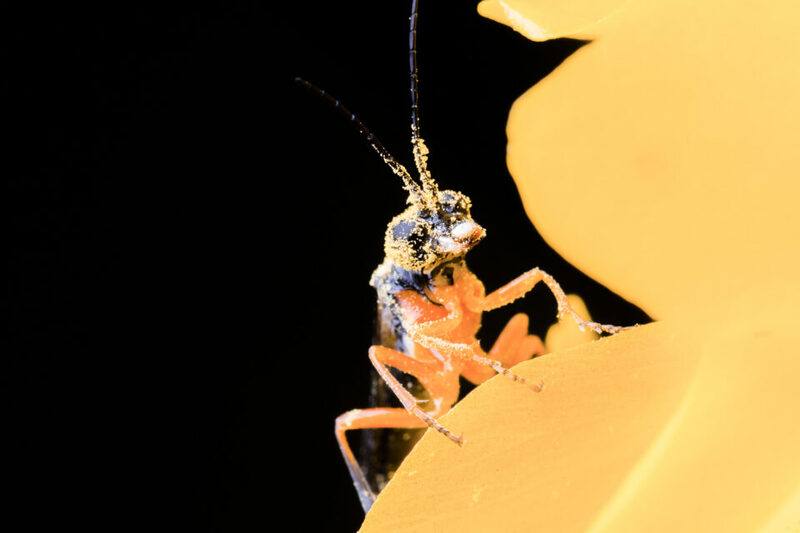 I also hope that this article helps encourage new macro photographers! As I see it, macro photography is an excellent way to learn the technical side of photography, even as a beginner, since it is so unforgiving. My first “good” lens (non-kit lens) was the Nikon 105mm macro, and learning all the complexities of this genre is the main reason why I was able to enter landscape photography, which I currently do the most, with a good knowledge of proper technique. I see that Arca-Swiss Cube C1 in the last photo – I confess I drooled a bit! Using a classic ballhead, there is always some “droop” after tightening everything up after repositioning. While not quite as important as a focusing rail, it deserves some mention on its own. But I still have not convinced myself that the cost (€1407 for the version shown) is worth it. I also have a focusing rail, a Novoflex CASTEL XQ II. I think yours are better. Are they Hejnar Photo rails? I’ve heard good things about the Novoflex system. Unless you’re aligning 600mm lenses with microscopic precision, the Hejnar rails might be overkill! Greg, sorry if it came across that way. I don’t work for or profit from RRS equipment. I shoot with a Nikon D810 and a Nikkor 200mm ƒ4 macro lens. The lens is long and very heavy, compared to the typical 105mm, but I need the space between subject and camera to maneuver. My low spine is fused in 2 areas so I don’t move well. That said, just like most I looked at something more affordable first. I started with an aluminum Bogen tripod and bought the Velbon macro rail (NOT the one shown above). My experience with it was horrible. I’d lock in focus and the instant I let go of the camera/rail/lens combination my camera would SAG! Terribly frustrating and impossible to use! I did spent weeks trying to “Guess” how much SAG I’d get, pick a target that’s not the one I want and hope for the best. Working that way is just too much trouble for me, I can’t bend over to view the setup that long (low back). You know what they say, different strokes for different folks, LOL. I just this other, cheaper, equipment works for some or they wouldn’t keep selling it? Thanks for providing a more measured and detailed explanation, Alan, I really appreciate that. Reading through the Q&A over on Amazon, the Neewer rail seems to be “good enough” for many people, and the updated Velbon rail appears to be almost universally loved. That said, if money weren’t an issue, I’d be more than happy to buy an RRS rail and place it on that terribly expensive yet utterly brilliant looking Arca-Swiss Cube head. One other thing I’d add is that if you’re shooting a subject low to the ground and using a tripod, a right-angle finder is extremely useful. With a RAF and a camera a few inches off the ground, you can see what you’re doing without getting a crick in your neck. For these situations, I have found the fully articulated lcd screen of my camera invaluable! It’s given me the flexibility to comfortably shoot from any position, from right on the ground to high up at the end of my fully extended balancing-on-my-chest tripod (triggered by wireless shutter release). The swivel screen has also saved my fragile neck during astrophotography/time lapse photography off a tripod. Totally agree – having that feature on the newer bodies has been great for really low and high shots, too. Thanks for adding this, David! As always, a very instructive article by Spencer. Great follow up discussion.I am a beginner and have ventured in Macro a little. I have a Tamron 100 mm Macro prime lens, w/o image stablization. I find impossible to use a tripod for outdoors shhoting. Even a monopod is not stable enough. I wonder if image stabilization is available on Macro lenses? Thanks for the suggestion of using AF-C and burst mode. It should be helpful. Often, image stabilization becomes less and less effective as you focus closer and closer. I’ve found some benefit even at 1:1 magnification, but it isn’t as much as you’d expect. (It’s more effective on some lenses than others.) Personally, the method I use instead is to light everything with a flash, so that blur from camera shake no longer becomes a problem. The duration of the flash is around 1/8000 second, depending upon its power, so it totally freezes nearly any movement you can think of. It doesn’t make focusing any easier, though! If you’re using a 105mm macro or longer, you can improve your DOF by backing away from your subject about 12-18 inches. The lens is long enough to bring in a very small subject as if the camera were right on top of it. Works for me, anyway. The other tips I know and use effectively. Also, macro is one place where a really good (really expensive) normal lens pays off. I think. Jim I. Yes, at magnifications like 1:2 or 1:3, you’ll get much more depth of field than at life-size magnification (twice as much at 1:2). Thanks for adding this. Macro photography is something that I want to start getting into. I am looking for the right equipment to get started with. These tips are very helpful to know for any beginner. Your photographs are stunning. The way you capture these photos are stunning. You take such a small object and make it the center of attention. You have to remember to take a look at the small aspects of the larger surroundings. I am happy to hear that you enjoyed the article and photos! I hope it gives you a good jumping-off point for starting in macro photography. You may find the general macro tutorial I wrote (photographylife.com/macro…y-tutorial) to be useful as well. Excellant article, thank you. 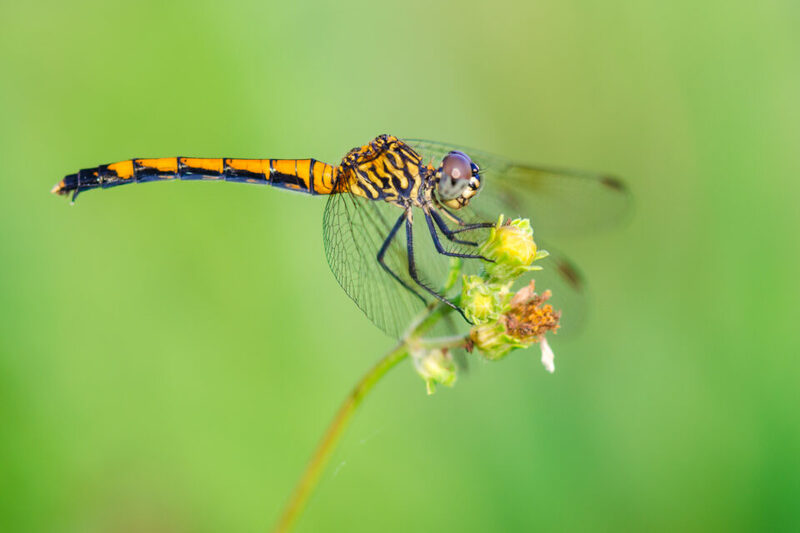 I have photographed wildlife for many years, but only recently got into macro, dragonflies, etc. I was confused regarding my recent poor focussing results, until I came across your article. In particular the mentioning of the photographer moving back and forth, and so continuous focussing becomes useful, (mostly I had previously used fixed focus mode). Thanks again!